This is not the correct way to secure a Sun Garden umbrella. The above umbrella was left extended, canopy closed but not secured to the frame properly. The umbrella sustain damages to the base and Ball Joint. 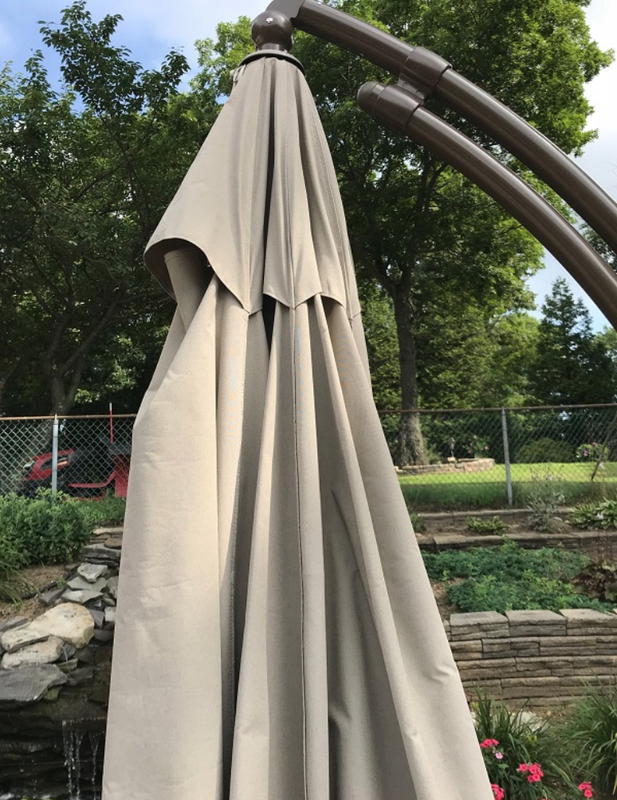 The above Sun Garden umbrella is NOT secured properly. While the strap is in the right place, it should be secured to the frame pole to the right. All patio umbrellas should be closed and secure when left unattended and darning windy or stormy conditions. The umbrella (example #3) is not corrected either. The canopy assembly needs to be strapped to the frame. A very strong wind can push the assembly sideways breaking the Ball Joint on top or ripping the canopy assembly right off the frame. The Sun Garden umbrella (example #4) is properly secured to the frame. In this setup the Sun Garden umbrella can endure strong wind without getting damage. With the correct amount of weight in the base this umbrella will only become a tipping hazard at winds of 60 MPH or greater. Before Using the 360° Swivel Function, slide the open ca- nopy down pole or close and secure. DO NOT attempt while the parasol is fully opened and deployed. See pictures on the right side.